Easy fusible appliqué quilt and home decor projects along with simple, satisfying recipes. 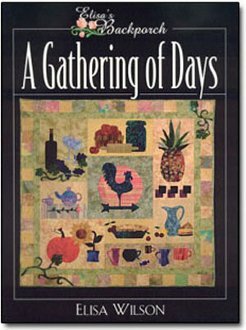 Book makes the complete A Gathering of Days quilt. Each block also makes an additional project including place mats, wall hangings, a tea cozy, and potholders. The book makes a wonderful gift or make some of the home decor projects to give as gifts. Don't forget the yummy recipes including Peanut Butter Pie and Taco Soup. Yum!